At the UBC Centre for Teaching, Learning and Technology (CTLT), there are currently 14 active communities of practice (CoPs). Leading these CoPs are 26 facilitators and co-facilitators from across campus. 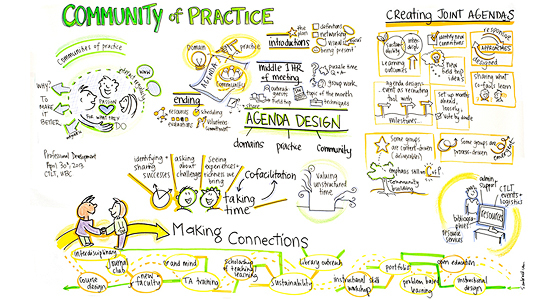 The graphic above was created by a graphic recorder, Sam Bradd, as a visual record of a recent session held for community of practice facilitators. This session is an example of one of the many ways that CTLT works to encourage members of the teaching and learning community to engage, formally or informally, in communities of practice. CTLT works with faculty and staff who are interested in starting communities of practice, and helps them understand the community of practice model and make decisions about how to launch CoPs or similar communities. We support individuals who decide to launch a CoP with practical assistance for CoP promotion, event planning, and facilitation of launch sessions. A few times each year, a network of CoP facilitators, as well as those who are interested in potentially starting communities of practice, meet for a professional development session. Past session topics have included event marketing, overcoming challenges, sharing updates, resource development, and critical incident sharing. Resources from these sessions, including the visual above, can be found at www.blogs.ubc.ca/cops. Etienne Wenger defines communities of practice as groups whose members “share a passion for something they do and who interact regularly to learn how to do it better.” Facilitators at CTLT have found ways to adapt Wenger’s conception of communities of practice to their own context of teaching and learning in higher education (Klein & Connell 2008). 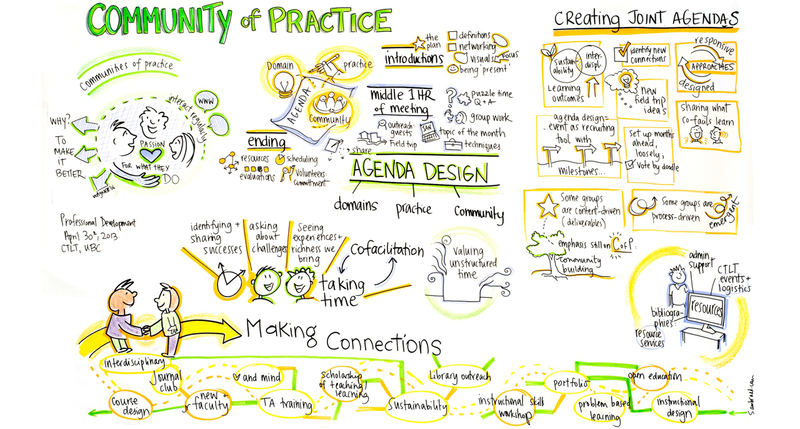 As depicted in the graphic above, communities of practice include three essential elements. Wenger describes these elements as domain, community, and practice. During this session, we found ways to connect these aspects of community structure into CoP meeting agendas. For example, some of the most successful communities of practice have found ways of building in regular timeslots specifically dedicated to building relationships among members. In several communities, this comes in the form of ‘puzzle time’ or ‘technique sharing,’ a time to share a puzzle you’re working with and have other participants brainstorm solutions. Other communities host a segment of peer-sharing, provide food for mingling and socializing, or provide a 15 minute networking break. At CTLT, we found it important, early on, to clearly focus on and value the role of the ‘facilitator’ of a community of practice, someone who is responsible for process, not content. In the session depicted above, UBC CoP facilitators shared ideas about what they have learned about effective CoP facilitation. As members of the broader teaching and learning community at UBC, we invite you to join in the conversations of the many communities of practice on campus as members and/or as facilitators. To join or start a community of practice, visit https://ctlt.ubc.ca/programs/communities-of-practice or email ctlt.copdeveloper@ubc.ca.